Here are some of our favorite science fiction books and series that have been published in the past decade or so. Like a lot of the science fiction classics, these are allegorical commentaries on our times, highlighting both the flaws and the wonderful moments in the 21st century. Some are fun and lighthearted, while others have a darker edge to them, but they all are great reads. Space Opera by Catherynne M. Valente – The publisher called this title “Eurovision in space”, which is incredibly accurate. The humorous and surreal descriptions of different planets and the civilizations they created are reminiscent of Douglas Adams, and it is best enjoyed with a sparkling soundtrack of 1970s pop hits. Binti by Nnedi Okorafor – This Nebula and Hugo award winner is a dark look at two species at war, told from the point of view of a young student, Binti. As the first in a series of novellas, Okorafor creates a powerful and fantastic world and a story filled with tension. A Planet for Rent by Yoss, translated by David Frye – What if the earth wasn’t the coolest place in the galaxy, but rather a dingy backwater planet? Cuban writer Yoss explores what it might be like with this collection of strange and somewhat unsettling short stories. All Systems Red by Martha Wells – This is the most delightful book ever written about an android. Ninefox Gambit by Yoon Ha Lee – Lee has created one of the most elaborate and epic science fiction universes to date. Fighting in a heretical war, Captain Kel Cheris must navigate through murky ethics to come out alive. The world of the Hexarchate is so vast you might not understand everything at once, but the story is worth it! Leviathan Wakes by James S. A. Corey – If you are totally committed to interplanetary voyages, space warfare, and big giant science fiction books, then we have a series for you. The Expanse, written by authors Daniel Abraham and Ty Franck under the confusing pen name James S.A. Corey, kicks off with Leviathan Wakes, winner of the 2012 Hugo Award for best science fiction novel. The entire series was nominated for Best Science Fiction Series in 2017. Pirates, biological warfare, transport ships, Earth and Mars at war, and a murder mystery all combine to make this an intriguing and fun read. The Queue by Basma Abdel Aziz, translated by Elisabeth Jaquette – Aziz’s surrealist tale explores the psychology of those living under an authoritarian regime. Stark and beautiful, the nontraditional narrative challenges the reader to think and feel the same horrors as the characters experience. A Long Way to a Small Angry Planet by Becky Chambers – Chambers has built an incredibly believable world of space travel with a cast of characters you are sure to fall in love with. Often compared to the television show Firefly, this novel feels like a family sitcom on a spaceship. We hope you enjoy these titles. 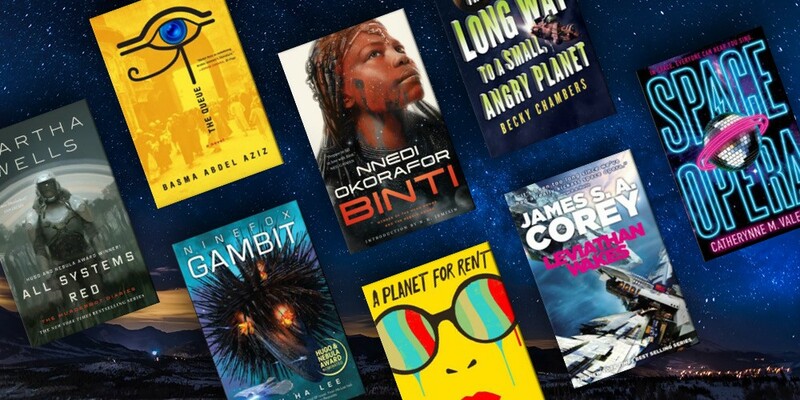 If you would like to find out about more science fiction, or from any genre, request your own personalized book list on our My Next Read page.